Poor This Will Destroy You. Due to the fact that the band is from Texas, and due to the fact that the quartet play the rousing, crescendo-heavy music that Explosions In The Sky made popular in the United States, TWDY seem to always follow in their big brother’s footsteps. The thing is, This Will Destroy You are not EITS little brother. They aren’t even half-brothers, step-brothers, or even second cousins — and the band’s new release Tunnel Blanket does everything to supply the DNA evidence. TWDY have always been a very dark and brooding instrumental outfit, and not much has changed this time around. If anything, they are treading further and further down this alienating path. Tunnel Blanket opens with the soft guitar notes of “Little Smoke,” a song owing more to light-hearted ambient tunes than post-rock stylings the band so earnestly seeks to avoid. But a ways into the beginning opus, “Little Smoke” comes into thunderous awareness with heavy drum hits and reverberations of heavy distortion. The song, at that one point, owes nothing to post-rock anymore, bringing in more elements of distorted shoegaze and the meticulous slow tendencies of doom metal. As the song progresses, the vocal shrieking (or guitar wailing — tough to tell) furthers this doomy, ambient notion. “Black Dunes” creeps and closes out with the best of the ambient artists around the world. That isn’t to say that TWDY have completely lost their post-rock influences. Songs like “Communal Blood” bring out some traditional post-rock elements, high guitar strumming, crashing cymbals, and explosive crescendos. But the band still slathers it in a mix of distorted ambiance — more fuzz than actual clean and crisp sounds. “Killed The Lord, Left For The New World” is a page almost taken straight out of EITS’s book, but just as quickly as the band dives into these post-rock soundscapes, songs like “Reprise” head straight down the ambient path, progressing at a snail’s pace, where you can practically hear the band breathing throughout the recording. 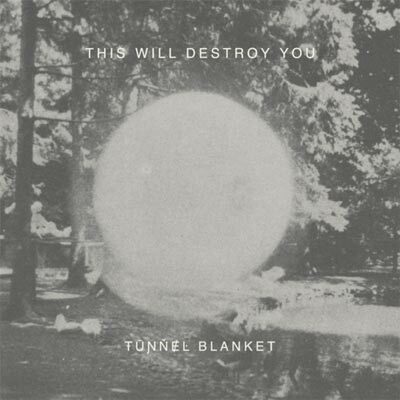 Tunnel Blanket is really This Will Destroy You’s greatest achievement so far. The band works hard to shed the post-rock label that it is so commonly associated with, and the elements of doom, ambient, and shoegaze almost make you forget about the easy Texas comparison. But TWDY haven’t totally changed just yet. The simplistic elements of post-rock that make it so easy to label every single band without vocals under the genre are still there… because maybe This Will Destroy You are still a post-rock band at heart. If that is the case, and if Tunnel Blanket is any indicator, the band won’t remain that way for long.